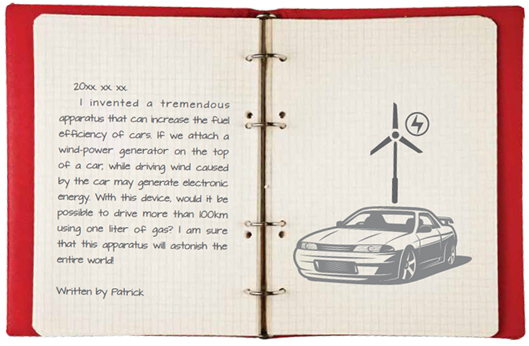 At first glance, this seems like a very clever use of a wind-power generator. Like Patrick’s thought above, many ancient scientists and engineers have tried to invent equipment that can do work infinitely. However, all of their attempts have failed. Let us observe water falling into a pond. In this situation, the falling water’s velocity causes it to have kinetic energy and this kinetic energy is turned into heat because of the friction in the water. Since heat raises temperatures, the water dropped by the waterfall has a higher temperature than the water that has not yet fallen. In 1843, before the British scientists James Prescott Joule experimented with his apparatus, people could not figure out why this phenomenon occurred. In the picture of the apparatus on the right side, blades rotate and stir the water as weights fall. 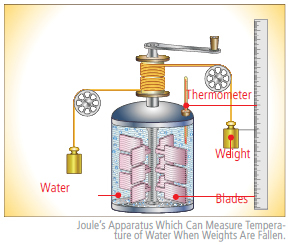 Joule measured the water temperature that was raised by the friction between water. From this, he proved that the work can be transformed into heat directly. The experiment was the fundamental foundation of the First Law of Thermodynamics, or the Law of the Conservation of Energy. The First Law of Thermodynamics states that the total amount of energy is constant, and that though energy can be transformed into other forms, it can neither be created nor destroyed. For example, when we rub our hands, some amounts of work, in this case rubbing hands, is transformed into heat, which we can feel on those rubbed hands. According to the First Law of Thermodynamics, all of the energy has been and will continue to be constant in the universe. Using this law, you can determine whether Patrick’s instrument is feasible or not. Firstly, in the car, the fuel energy is turned into work that rotates the wheels. Then, the work that was applied to the wheels is transformed into the kinetic energy of the car and the kinetic energy drives the wind around the car. Even though the wind energy is turned into electric energy, the sum of energy is the same as the initial fuel energy. For example, assume that your car can use one liter of gas to drive 10km. If you install a wind power generator on the top of the car, your car will move less than 10km and store the rest of energy in the form of electricity. In this example, this “rest of the energy” is used to operate the wind power generator and create electricity. As a result, although you have used all the generated electric energy for driving, you can still only drive your car just 10km, the same as before. Therefore, unless you use more fuel, the movable distance of the car will not improve. When two objects that have different temperatures contact each other, is it possible to increase the temperature of the hotter object and reduce the temperature of the colder object? From the perspective of the First Law of Thermodynamics, this can happen because the energy of both objects is conserved. However, we empirically know that this phenomenon cannot take place. The Second Law of Thermodynamics is related to the direction of the process. This law states that heat always flows from hotter objects to colder objects and processes go in only one direction. In other words, processes are irreversible. This is why the above phenomenon does not occur. Additionally, the law asserts that we cannot make devices that transform pure heat into work. This is the reason that engineers have failed to build machines that have 100 percent efficiency. According to the Second Law of Thermodynamics, it is obvious that heat flows from a hotter outside to a colder inside and this heat makes homes hotter. However, machines exist that can reverse the flow of heat: air conditioners and refrigerators. Air conditioners lower inside temperatures by extracting heat from homes. This may seem impossible, but air conditioners receive work (electric energy) at the expense of extracting heat. You may have observed an outdoor fan that is connected to your air conditioner and releases hot wind. Since we get cold air, the air conditioner has to transfer heat outside. The colder the inside of the building is, the hotter the released air gets. Refrigerators and air conditioners have very similar principles. When you open the door of a refrigerator, you can feel the cool air instantly, but the temperature inside will get higher eventually. Using the Second Law of Thermodynamics, can you explain why refrigerators increase the temperature? If you can, you have now understood the Laws of Thermodynamics.